Go Cap, it’s your birthday! We know that Mercury in retrograde snuck up on you hard last month and got you shook, but it doesn’t mean you need to take things to the extreme. You’re a strong force of nature, so you have to slow your roll a bit. Don’t worry, you don’t have to contain all of your feelings. Take your active mind to the kitchen and challenge yourself to your own cooking show. It’s easy to pretend to be a celeb chef when you can get the ingredients to your door. 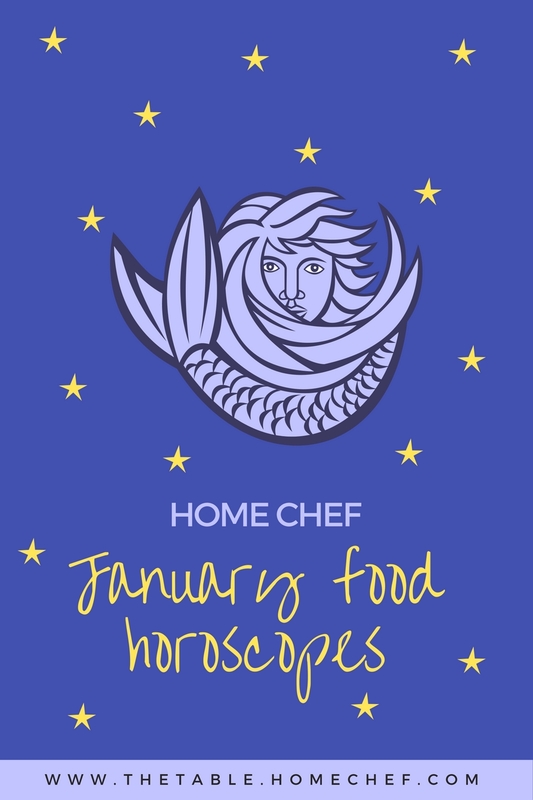 We suggest getting cheffy the week of the 16th, when Mercury finishes its retrograde. Hold on, did someone say crispy teriyaki tofu? Suh Aquarius? Slide on into the new year– and don’t forget to leave 2016 behind. It’s hard for you to let things go sometimes, but you gotta. The year that should be erased from history should be erased from your history, too. 2016 wasn’t all bad though: How about those food trends? Smoothies are the new black and are perfect for your new year detox. Start your cleanse on the 3rd when Mars and Venus are in your house. Go ahead, and drink your breakfast instead, because we know you’re always on the run. Blend it up, Boo. Uh oh Aries, it looks like Mercury in retrograde did a number on your personal life. Don’t worry Boo, the sun coming into your zone around the 8th will be your wakeup call. Stay woke, Aries. This is your month to shine like a starboi at work. Just don’t neglect your life at home. Whip up something spicy for someone special. Get your mind out of the gutter… we’re talking about the kitchen! Who said variety is the spice of life? We all know it’s really Cajun food. Keep a glass of water nearby. Bonjour Taurus. We know you’re still feeling those *~vacation vybes~*. Even though the holidays are over, it’s ok to keep your mind in vacay mode. It will fuel your passion for all things exotic. Go ahead, use the sun sailing into your zone around the 19th as an excuse to take that trip you’ve had your eye on. Used up all of your vacation days? No fear, travel with your palate. Go to South Korea, Mexico and Italy in one week sans passport with Home Chef. Prepare for take-off. Hey Gem. You might act like you’re “2 kool 4 skool”, but you might have to slow your roll. You’re still hype from the holiday celebrations. Mercury comes out of retrograde around the 9th, so take that time to calm your mind and body with some chill weekends (no, not Netflix & chill. Literal chill.). We know you’re the ultimate social butterfly, but get back in that cocoon for some quiet alone time. Being left to your own devices is dangerous, so keep busy with a challenge. Try cooking at home for yourself. We know you’re familiar with the mojito (maybe too familiar), but have you ever had mojito lime chicken? Challenge accepted. Come out from your shell, Cancer. With the sun blazing into your house on the 13th, your bright and bold personality that you’ve been hiding will come out. Go ahead, strike up a conversation with the coffee house cutie, this is your month to shine before you retreat back into yourself around the end of the month. Speaking of seafood, get your date on by making a delicious seafood dish for your new boo. We know you can be shy, so let the food do the talking and the rest will come naturally. Parlez-vous deliciousness? Hold up Leo, it’s not Valentine’s day yet. You’ve got hungry eyes for all those hotties, but how about you direct those eyes toward some spicy food? Everyone knows your adventurous spirit can’t deny a challenge. Beat the winter blues with some Hawaiian food. That Sriracha will get you fired up enough to blaze through your new year’s resolutions with ease. Don’t forget to get some R&R before the sun enters your house on the 19th. Ever heard of Netflix & chili? New year, do you, Virgo. We see you fogging up those windows at the gym, Boo. Your 2017 is already lit like Betty White’s birthday cake. It will be easy to stay lit with the sun raging into your house around the 14th. However, be careful, as it might shed some unforeseen light well-hidden issues. The cure for that? Tacos! Introduce #TacoTuesday into your life. With power couple Mars and Venus floating into your zone at the end of the month, you may even be taco-ing for two. Hey Libra. With Mercury in retrograde until the 8th, your homey nature is dominating your demeanor. You’re going to be secretly happy when your friends cancel plans. You’re about to get nice and cozy with a blanket (and maybe a boo). ‘Tis the season to cuddle, so bring out your deeply romantic side to find a partner for the season. Don’t forget the grub. Getting cozy will have you working up a major sweat, so get between the buns under the blanket with a bomb burger. New year, new boo? That’s right, even in the dead of winter, it’s the season of amoré, Scorp. Don’t forget to impress. You know that friend who always has the best stories? Well, that will be you this month. With the sun sliding into your house on the 19th, you will have a bright creative streak coming. Show off your mad skillz in the kitchen. Better yet? You don’t even have to go to the grocery store… have some colorful thai turkey lettuce wraps delivered to your door! Your boo with thank you (and you can thank us later). Yo Sag. We know you’ve been looking forward to hibernating this winter, but you might have to put that on hold. Your 2017 is off to a busy start. Now is the time to say “yes” to everything and try new things. Take a painting class (one with wine is preferable), try yoga, and cook something saucy (we’re not just talking about the sauce, Sag). Have you ever paired parsley and pistachio? Get lost in the sauce with this delicious dish. The sun will rule your adventurous side this month, so get to steppin’ some new experiences. Get your chef on with Home Chef. What’s cookin’ good lookin’?